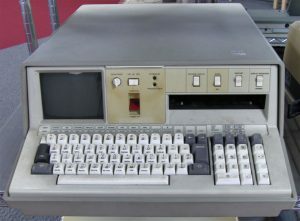 The IBM 5100 was introduced as IBM’s first “Portable Computer” in September 1975, six years before the IBM Personal Computer. It was the evolution of a prototype called the SCAMP (Special Computer APL Machine Portable) that was developed at the IBM Palo Alto Scientific Center in 1973. In January 1978 IBM announced the IBM 5110, its larger cousin, and in February 1980 IBM announced the IBM 5120. The 5100 was withdrawn in March 1982. When the IBM PC was introduced in 1981, it was originally designated as the IBM 5150, putting it in the “5100” series, though its architecture was not directly descended from the IBM 5100.